Your skincare routine likely evolves as you try new products and changes as the season does - I know that's the case for me! There's always endless pages of new beauty arrivals at cosmetic stores and with so many things that are new and "improved" and "the best ever", who knows what to try?! And not to mention how expensive it can get to try new products and have a draw full of face masks and foundations... Getting off topic here, but you get the point. ;) Summer skincare is unique in that you likely have been in the sun, have a tan or maybe burned a little bit (oops! But we've all been there...) or you feel like your skin is needing some extra TLC before/after/during a trip. I'm a firm believer that less is more AND that your glow comes from your skincare products you use. They technically go hand-in-hand, right? Sticking to the less is more theme (clearly channeling my inner Meghan Markle, which isn't ever a bad thing! ;), I've been trying out all sorts of new products to achieve a simple, quick and affordable summer glow without using too much product. 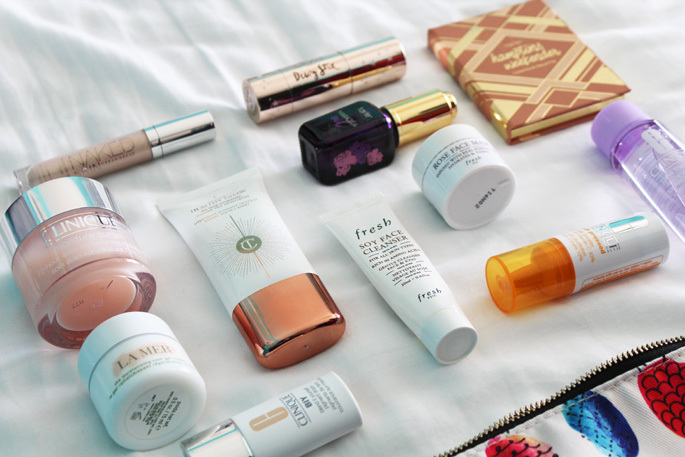 Here's everything you need to add to cart - for real - to achieve that flawless look this summer! I could go on and on about different products to try and what I think you guys would like and what might work but that wouldn't be that beneficial, hah! These are my tried-and-true products; the ones I have (and plan to) re-purchase and what has worked wonders for my skin and to give you that simple but beautiful glow. Naked Skin Highlight Fluid: I tried this on the whim when I saw it was on sale for $14 (regularly $28 - get it while it's still half off!) and I'm SO happy I did. It's absolutely beautiful and gives the perfect amount of shimmer without overdoing it. I've always been a big fan of the Naked brand Concealer and use it more than any other concealer so I figured I'd like this highlight! I've rarely ever used a liquid highlight before but now I don't know how it took me so long! It's perfect for summer sun-kissed skin, especially with a tan - it'll look completely flawless versus a powder that may not last as long or look as good with your tan. Clinique Moisture Surge 72-Hour Moisturizer: it's no secret that this is my favorite moisturizer, my go-to product, the beauty buy I get over and over again! I LOVE this stuff. It's the most cooling, moisturizing non-sticky, lightweight moisturizer I've ever used. I use it every single day but now that summer is here I'm even more thankful for it! You will absolutely love it and so will your skin! Clinique BIY Drops: another favorite of mine that I rave about nonstop, and that goes hand-in-hand with the aforementioned moisturizer, that I also talk about non freakin' stop. ;) You can read basically a book long about how much I love these in my Everyday Makeup Favorites post, but the best part about them is you can customize your coverage based on how many drops you use and mix with your moisturizer. Using one drop in the summer would be pretty much equal to a tinted moisturizer and that's my favorite in the warmer months! They mix with just about any moisturizer you prefer to use - who knew a beauty product could be as versatile as a great pair of shoes? Luminous Highlighting Dewy Balm: this is a newly found product that I've been using NONSTOP for about a week. I am obsessed and it's my favorite beauty buy in a LONG time! It comes in three shades - I bought the "Glow - Natural Transparent" and it's basically a colorless balm that gives you a dewy, natural highlight. It's genius! I love a good highlight, but sometimes I feel like I add too much or that it's not the right color for me or it's too much for everyday. This balm is what dreams are made of, lol! It lasts all day long and it isn't sticky which for me is the best part. It isn't at ALL shimmery (in this shade anyway!) and looks completely natural. I sound like a broken record at this point, but it's PERFECT for summer skin. This is a must buy! Charlotte Tilbury Healthy Glow Tinted Moisturizer: I know everyone raves about this and I decided to give it a try... I can see why it's a favorite! It's kind of crazy the first time you use it because it comes out of the tube white, and once it hits your skin it transforms to match the color of your skin. Again, the perfect summer beauty product because you don't have to worry about matching a foundation shade to your skin based on your tan; it'll match your skin tone no matter how much it changes from the sun! It isn't drying, lasts a long time and has a flawless finish. The only downside is the smell - I don't love it, but it doesn't last and you only smell it when applying it so it isn't a tie breaker. La Mer Moisturizing Cool Gel Cream: soo if you've been reading some of the latest beauty posts around here then you know I've been going back and forth with whether I should try out this moisturizer regardless of it being semi-stupidly expensive... Well I bought it finally after using tons of samples of it and I'm so glad I did! I LOVE it. The best pros are that it works wonders for your skin, it's extremely cooling and feels incredible the second you put it on. The cons are that it's expensive and the jar is heavy, even in the smaller size. It's probably not a necessity for your skin with how many other great moisturizers there are, but I'm pretty sure it'll be a favorite as I get more sun and travel more this summer. I'm planning on doing a full review on this La Mer Cream but in the meantime if you've been considering it, I'd say it's worth a shot! One use softens your skin and that's worth the $$$ if you ask me! Tarte Maracuja Oil: if you need to brighten your skin or need a boost of radiance, this is exactly what you should buy! Any Maracuja or Marula oil is like gold for your face but I've been loving this one in particular and it's affordable. I apply it before bed every night and occasionally before I apply makeup in the mornings but it provides deep hydration and for an oil, it doesn't leave you looking or feeling oily. It's magic oil! Hah! Fresh Soy Face Cleanser: out of hundreds of cleansers, this is hands down the best one I've ever used. It's great for all skin types and it's gentle while it still works so well! Fresh Rose Face Mask: no matter when or how you use this, it'll become your favorite face mask but I added it to this list because it's the most hydrating one I've tried and that's exactly what summer, sun kissed skin needs! Tarte Contour Palette: I originally bought this palette because of the blush shade - it's THE prettiest, most perfect pink for glowing summer skin! The highlight and bronzer are just as beautiful and this palette is so compact and great to take with you where ever you go, including in your travel beauty bag. Clinique Daily Vitamin C Booster: the sun is great, but it can do some damage to our skin even if we're super careful and use lots of sunscreen. This boost of Vitamin C is a MUST have in your beach bag this summer - it's perfect for the natural glow we all crave! Clinique Take the Day Off Makeup Remover: I normally use makeup removing wipes just based on preference, but this works just as well - if not better - and it isn't as rough on your skin as using a wipe often is. I just tried it out in the travel size to see if I'd like it and it's great to take on the go - it's even perfect to fly with. If you are wanting something cheaper, the Garnier Micellar Water works just as well and it's much cheaper! 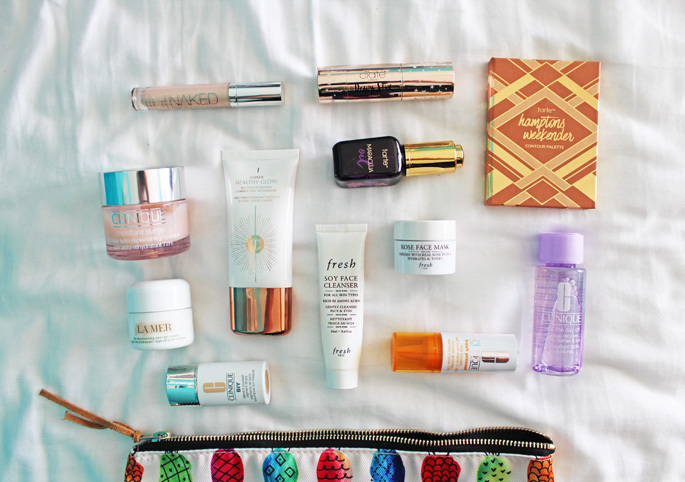 Yes, great picks, especially the La Mer gel cream! It's one of my summer favorites because it's so cooling and soothing! I love these kinds of posts. There's seriously so many amazing products to try and I love getting others opinions on them. These all sound so great. Thanks for sharing! I can't wait to try some of them. So many great goodies! And now I seriously want to try out that clinique moisturizer! I have been on more of a budget since moving a couple months ago so I haven't bought many new beauty items lately (moving reminded me too how much makeup I do have LOL!) - but these all look so great!! :) Love those pretty blush colors! You've got so many different options here! I am always on the hunt for new things to try. hey these products seem to be really koolll... i think i will try it.. So many great options! I do barely anything right now for a skincare routine so I'm excited to check out these products. I definitely need a moisturizer and that clinique one sounds fab. I use several of those already, but there are others that I can't wait to check out. Thanks for sharing! ok i seriously love all your pictures and i def want to take some of these into my own skincare routine! my skin is always so dry so the moisturizer is huge! These are great picks, I would love to try Clinique and la mer I have heard great things about them. Ooooo found some new products I need to try soon- I love anything by fresh! They have such a great line of products. Love all of these. so amazing... I need to try some of these asap! such wonderful colors. I love a more natural look but I'm not great with makeup so this should be helpful. And I absolutely love that pineapple makeup bag! ohhh now i want to give that CT product a try! what's the coverage like? Oh! I want to try the tinted moisturizer! These all sound like such great products! These are great picks!! I used to use the Clinique Moisturizer before I found the Neutrogena Hydro Boost one- it's an amazing dupe and it's only half the price of the Clinique one. Love this roundup! I love tarte cosmetics!! I have the CT moisturizer and I love it. So many great products! I love the Lamer cool gel cream. Want to try the Tarte ones next. These all look amazing!! I've heard nothing but amazing reviews on that La Mer moisturizer! There are so many goodies in this line up! Especially love the La Mer face cream - it smells so good and feels amazing on the skin! ohhh so many great finds! 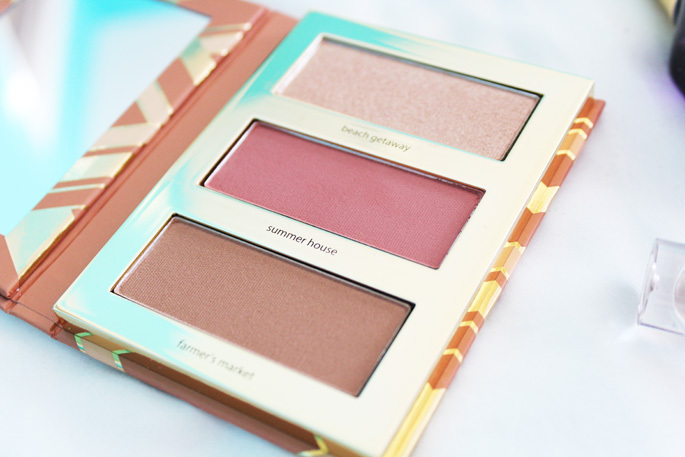 that tarte trio looks so pretty! I don't really wear make up, especiallyyyy in the summer! it's too hot and sweaty lol but i wear sunscreen! So many of those are in my bag too!! Love your picks. So many new prodcuts I need to try! I'm eyeing that Tarte palette! Give me all the contour palettes! I'm in the market for a great tinted moisturizer this summer so I am thankful for the recommendation. 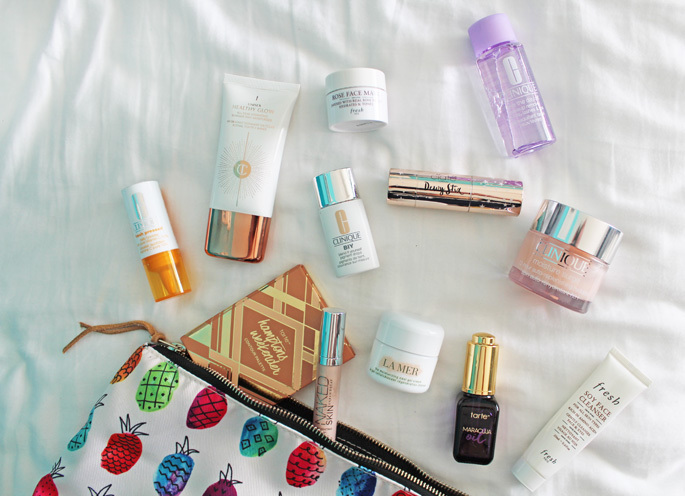 Bring on summer beauty products! I need to try that gel cream! I tried the one by Tula recently and love it! I'm going to have to try these. I don't think I've ever tried any of them! These are great picks for the summer! I love the Fresh brand, and Urban Decay's Naked. I've had La Mer on my wishlist for quite a while... I know the price is hefty, but I'm hoping to treat myself at some point. Thank you for sharing this--now I have what I need to switch it up on my summer routine. I love that tarte contour palette. OK I can't get into the CT glow moisturizer thing that everyone raves about - IDK what it is! But I don't get the hype!!! Looove the Fresh rose mask! So refreshing. It's been so hot here that I just wear some concealer and lip tint haha. Loving all the Clinique products! I use their foundation, but I also LOVE their moisture surge moisturizer! That Clinique moisturizer is the best! I am amazed that it handles my skin on both its super dry days and super oily days. It sounds like I need to check out the BIY drops to go with it! My last contour palette got destroyed while I was traveling, and I'm yet to replace it. The palette in this post seems like an awesome replacement! These are some awesome products!! I seriously LOVE La Mer. I know it's a splurge but SO worth it! Love! Need to try the LA MER cream. Been dying to try their products! Loving these products! I definitely need to stock up before my beach trip next month! That tinted moisturizer sounds so amazing. I have been looking for one of them! These are awesome picks! I’m currently loving anything Peter Thomas Roth as well as the Simple Hydra Water Cream! So I definitely use quite a few of these already, and I swear by them! I need to get some more products from La Mer, it is one of my favorite skincare brands! Ooh I love La Mer! Great product highlights!